Waterproof GORE-TEX® lining laminated to the outer shell. Meaning, you don't have to zip in another liner to stay dry. YES! Outer shell is constructed of a combination of 1000Denier Cordura Ribstop with Teflon coating, PWR|Shell 750Denier with Teflon coating and PWR|wax 500Denier. Basically the most protection that REV'IT has to offer for women's gear. If you haven't read up on the properties of GORE-TEX®, go check out their website. It's considered the most breathable, waterproof materials on the market. It really does make for a more comfortable ride in changing weather conditions. Of course, if it's 90 degrees out, it's going to be Hot. But if you're going back and forth and need one outfit to work mostly in the extreme cold and sometimes in the heat, a GT lined pant is the way to go. I've worn one other pair of riding pants that were waterproof on the outside, and those were the Olympia Pro Max's. These are just as warm, if not a little warmer but not nearly as breathable as the Legacy. These are not designed as overpants, meaning they don't have full side zippers from the hip to the foot for easy in and out. However, I do wear these over my jeans (which tend to wear very fitted). I'm able to wear these comfortably underneath for short commutes across town. I would never, ever wear denim underneath these pants for a long trip though. But short rides to and from someplace that you can take your pants off and relax in are definitely doable as overpants. Although I've worn these in temps down to the low 40s (30s with windchill), I never felt the need to put the thermal liner in. Just wearing Schampa pants have been more than warm enough for me. If I wore the thermal liner and the Schampas, I I could probably ride in even colder temps. I received the entire outfit right before my trip to Horizons Unlimited in Cambria, CA (470 miles round trip). The temperature started out at ~80 degrees in San Francisco and then dropped down to high 50s by the time I made it into town. Wearing just my Klim Solstice baselayers almost all the way down, I was super comfortable and never got cold. The breathability is wonderful, and definitely noticeable. No, they aren't as light as a meshed pants such as the Airglide or Tornado, but if you're not spending a whole lot of time in hot weather, you'll survive if you wear a light, moisture wicking baselayer. I used the vents when I was in the 80s and definitely felt the extra air flow. But I didn't feel stifled in the rest of the pants. Pockets! I love having *real* pockets that I can actually put things in. These pockets are so deep that I've lost my bike keys in them because they were way at the bottom. They're log enough that I can put my iPhone in them and still ride in them comfortably. The long zipper pulls also make it super easy for me to open or close the vents while riding. Because the pants are a little high waisted, the zipper pulls on the pocket are hard to reach when I'm on the bike. But I do love that REV'IT used thicker, sturdier zipper pulls all over the pants and jacket for easy up and down. I've had the pleasure of riding in the rain more than a few times so far this winter, and I'm happy to report that these have kept me bone dry each and every time. It's great knowing that my pants are waterproof without having to worry about a liner or wearing something over my gear to stay dry. It's amazing how happy one can be riding in the rain, knowing that she'll stay dry the whole time. It's dramatically increased my rainy riding comfort level. I snapped a couple pics of me arriving home drippy and wet for you. It never felt that way and I really couldn't feel that I was wet until I got home. Of course, I'm wearing above the ankle waterproof boots, so that definitely helps. Not once did I ever feel weighed down or cold from the exterior layer getting soaked. A really nifty feature (as with all the ladies REVIT pants) is that the knee armor is adjustable so you can move the armor up and down, or replace it altogether if you want something even better than Prolife. The armor feels fine and I don't feel the need to change it out anytime soon. My only complaint about these pants are the fit at the ankles. 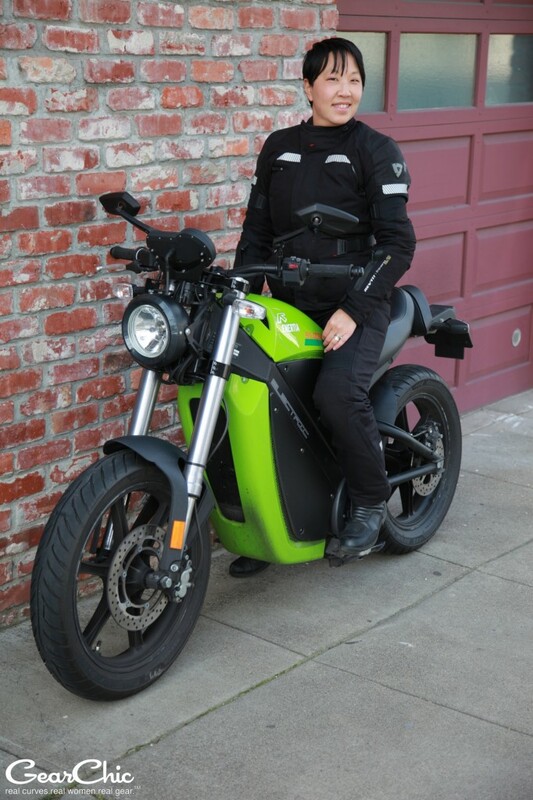 But I see why the pant legs are a little wider, in order to accommodate dual sport or larger riding boots. I'm wearing a fairly narrow street boot right now, but if I were wearing something more appropriate for adventure riding like the Sidi Adventures, I'm sure I would appreciate the wider fit. When you are on a bike with a super forward riding position, it can be hard to find touring gear that fits as well in that riding position. Looking at these pants, you'll notice that they taper really nicely at the knee. Who's knees are as wide as their thighs? Not any women riders I've ever met in my 9 year riding career. If the pants are fitted closer to your leg, then when you sit on a bike (especially sportbikes with higher foot positions) the pant leg won't rise up as much and it tends to stay in place a bit better. Also notice that my pant length *isn't* all the way to the heel of my boot! This is why you realistically need about 1" less than your true inseam, or what you would wear with casual pants. They aren't going to ride up as much and you may only need the standard length vs. the long in these. I'm blessed with a short torso and longer inseam so I only need the standard length. The fit in the hips/waist is average. They definitely ride high on my waist which is something I always seem to have a problem with when it comes to riding pants. These are a little high too, but I'm used to it. The hip space feels a touch narrower than the Venturas, so you might want to order a size up if you have ample hips. There's a good amount of thigh space too. I have just enough hip space when I wear my thermals under my jeans and then wear these over (it's really really cold inside Scuderia in the winter). I'd say the fit on these are closer to the fit of the Tornados, shorter across the front from hip to hip overall. I love these pants for winter riding. They're the perfect compliment to the Legacy jacket, but certainly would make for a great compliment to any riding jacket you already may have. 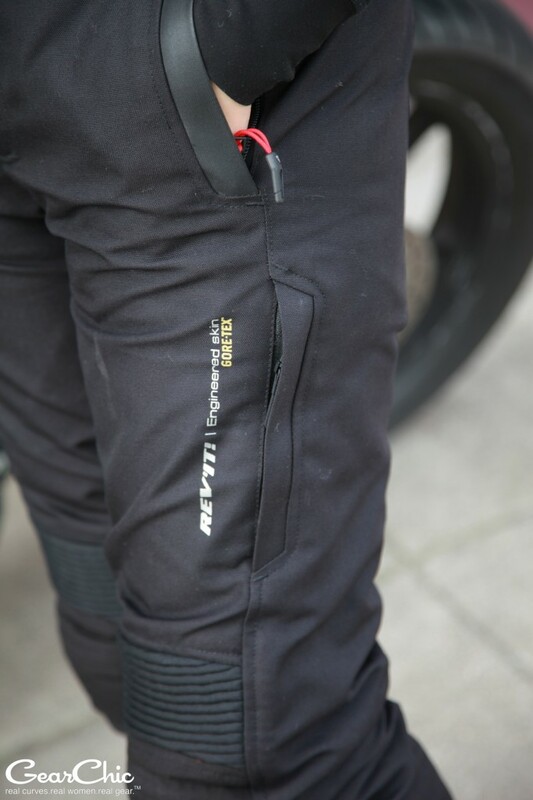 The fully waterproof shell, combined with the great fit, protective shell materials and deep pockets make these the best riding pants I've ever worn. This is the kind of outfit you buy once every 10 years and hold onto for as long as it'll last. Just remember to read your GORE-TEX® care instructions to make sure your outfit stays waterproof. They actually recommend washing And drying your gear. It also needs to be cleaned every now and then to maintain the waterproof-ness. I would highly recommend these to anyone looking for the perfect winter riding pant.